Product prices and availability are accurate as of 2019-04-14 16:56:57 EDT and are subject to change. Any price and availability information displayed on http://www.amazon.com/ at the time of purchase will apply to the purchase of this product. Twice the brewing options, at half the price. On the left: a steam-pressurized espresso and cappuccino system with safety valve and a "Perfect Froth" attachment. 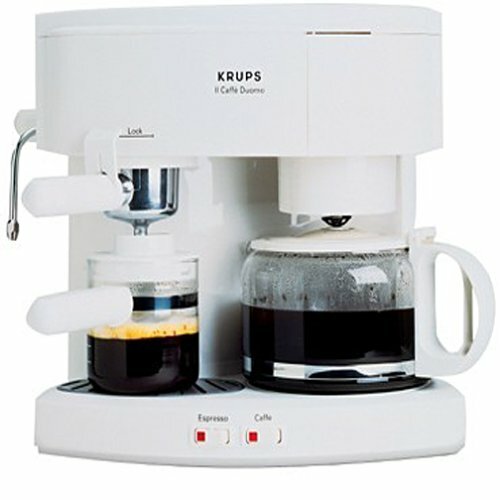 On the right: an 8-cup coffee maker with stop-and-serve feature, nonstick warming plate and convenient swing-out filter holder. 16Hx23-1?3Wx13-3?4D. By combining a regular coffeemaker and espresso machine, this appliance makes it possible to satisfy every coffee craving with a single, compact unit. The espresso machine includes a steam nozzle with a frothing attachment for making coffee drinks like cappuccino and café latté. Make espresso the traditional way: tamp the proper amount of coffee into a filter basket inside a filter holder, twist the filter holder onto the machine, pour cold water into the machine's boiler, and flick the "espresso" switch. Brew up to 8 ounces of espresso into a glass carafe or directly into one or two espresso cups, (a two-cup adapter is included).